Entry for appointment of Charles MacDougall as postmaster of Apex, California from Record of Appointment of Postmasters, 1832-Sept. 30, 1871, National Archives and Records Administration. If I happen to mention Apex during one of my local history talks, it usually draws puzzled looks. You won’t find it on a map today, but it was a post office in northern San Diego County between 1881 and 1884. The Apex post office was created in February 1881. Its first postmaster was Charles A. MacDougall. Like a lot of post offices in those days, it was at first located in the postmaster’s home. From coverage in contemporary newspapers, it appears that the post office was on the ranch that MacDougall jointly ran with his brother William. The MacDougall spread was one of a number of ranches developing at that time as a result of the sale and subdivision of two large Mexican-era ranchos: Los Vallecitos de San Marcos and Rincon del Diablo. Among the other homesteaders listed as living in the Apex area in 1881 was Gustavus French Merriam. When Merriam arrived to homestead 160 acres in 1875, he christened his property Twin Oaks Ranch after two joined 70-foot oak trees on the grounds. Over the years, that name would be applied to the whole valley encompassing his ranch. Interesting thing about how fluid place names can be. Where? The reference was to an area further south, in the heart of Rancho Rincon del Diablo, which was then owned by John Wolfskill. John Wolfskill, his brother Josiah, and another partner had purchased the 12,700 acre rancho in 1868. By the time of the 1883 Sun article John Wolfskill was a state senator and apparently doing well raising sheep, cattle, hogs and a variety of fruits. That name appears to have stuck. Sources for this post included historic San Diego newspapers, the National Archives of the United States, and the archives of the Escondido History Center and the San Marcos Historical Society. Program for Rancho Bernardo Concert On the Green, July 9, 1983. Courtesy Rancho Bernardo Historical Society archives. 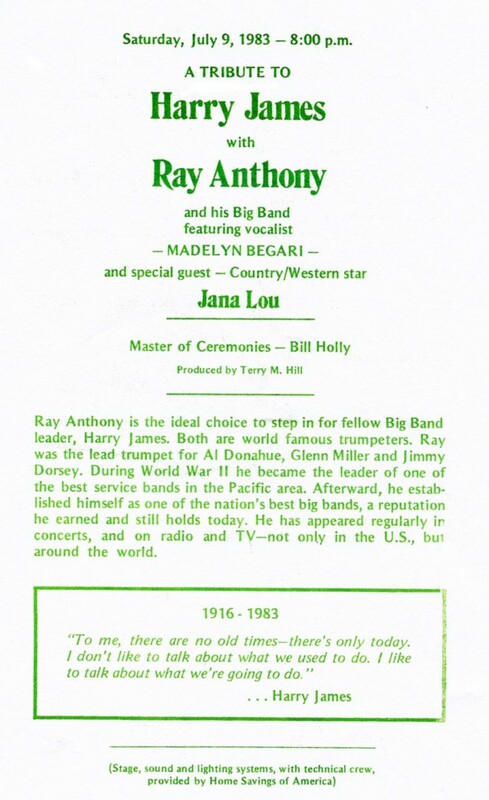 Anyway, I ran across an instance where San Diego history and the often unique personalities of show biz people came together, in the person of trumpet great Harry James and the Rancho Bernardo Concert On the Green Series. The Concert On the Green Series began as the brainchild of one of the leaders of AVCO Community Developers, which had taken over development of the then-new community of Rancho Bernardo in 1968. A group of dedicated community volunteers took the idea and ran with it, staging annual concerts by the San Diego Symphony and other popular musical acts every summer on the driving range of the Rancho Bernardo Inn’s golf course. Was it a popular idea? Well, the first concert, in 1972, sold 6,275 tickets at a time when the total population of Rancho Bernardo was just over 10,000. It would continue as a popular and beloved community event until 1993. The series was at its peak in 1983 when the announced theme was “Summer of the Big Bands,” with James’ band leading off a season that also included other great Swing Era outfits like Les Brown and His Band of Renown and Bob Crosby and the Bobcats. Harry James was one of the giants of the Swing Band era, as both a trumpet virtuoso and a bandleader whose musical alumni included singer Frank Sinatra and drummer Buddy Rich, among others. James was a trouper in the classic show biz sense. Driven by his own personal demons, he lived to perform, according to a biographer. In the spring of 1983, 67 years old and suffering from years of one-night stands–musical and otherwise–and hard living, he was diagnosed with cancer. Yet even after surgery and chemotherapy James was still playing gigs, including concerts in Denver on June 10 and 11 and a private party in Los Angeles on the 26th. He was booked for dates on July 8 in Hemet and then July 9 in Rancho Bernardo. But he didn’t make it. James died in a Las Vegas hospital on Tuesday, July 5. Ray Anthony, another swing band trumpeter and bandleader, agreed to take James place, and included a tribute to the music of the Harry James band in his repertoire that night. Bob Crosby, who lived in La Jolla and was scheduled to appear elsewhere in San Diego that week, paid tribute to James in an interview with the San Diego Union on July 6. Sources for this post included the archives of the Rancho Bernardo Historical Society, historic San Diego newspapers, and the book, Trumpet Blues: The Life of Harry James, by Peter J. Levinson. “Star Route” might sound today like an astronomy term or the title of a science fiction film. But in the 1890s in San Diego County and elsewhere in the USA, it designated mail delivery routes not serviced by railroads, and that still covered a lot of territory. “Not all of Uncle Sam’s business in the matter of carrying mail into and out from the San Diego Postoffice is done by the railroads; in fact the stage lines carry a great deal of it….” began an article in the June 12, 1890, San Diego Union. “All stage routes throughout the United States and in fact all mail routes off the line of railroads are denominated ‘star routes,’” the article stated. It then went on to explain the name as derived from the * symbol (looks more like an asterisk to me, but maybe too long and less colorful a word) which marked postoffices getting their mail by stage rather than by train. In 1890, Star Route 46-386 serviced the Escondido area. The mail “leaves San Diego every morning except Sunday morning at eight o’clock for Escondido and offices along the route. Returning the mail arrives each day except Sunday at 4 p.m.,” according to the Union. 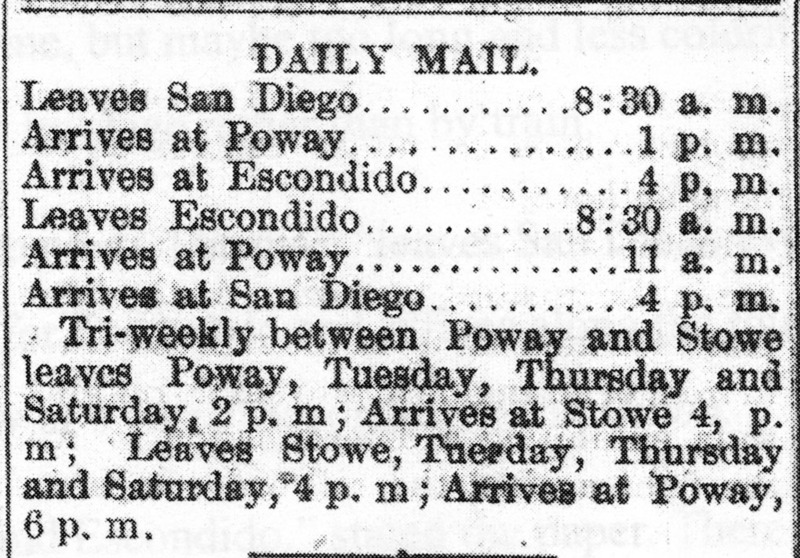 “Over this line mail is sent for Poway, Bernardo and Escondido,” stated the paper. There was also tri-weekly service on that route from Poway to Stowe and from Escondido to Mesa Grande. 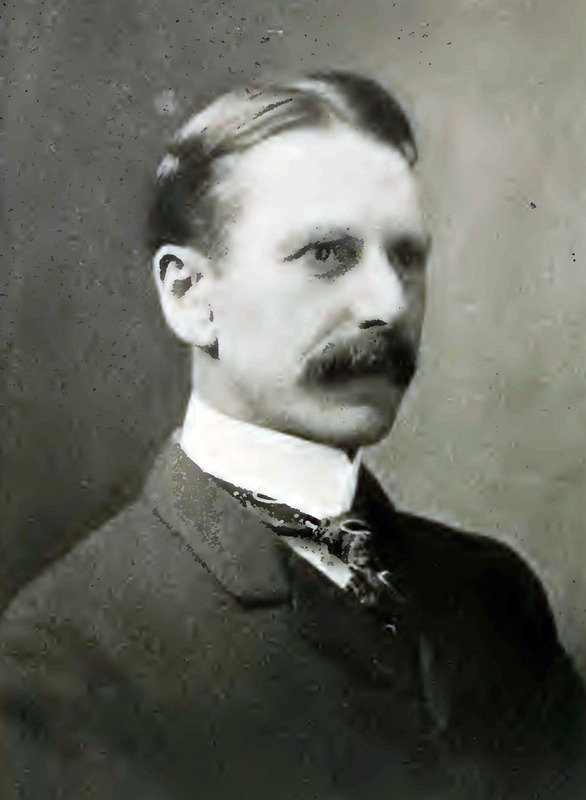 Photo of George Marston from volume II of William E. Smythe’s History of San Diego: 1542-1908, published in 1908. A couple of weeks back I wrote a brief post about George W. Marston’s 1913 mayoral campaign. He lost in 1913 and 1917, but he is far better known as a successful department store owner and philanthropist. He was also a strong advocate of park development and city planning. He built the Serra Museum and Presidio Park at his own expense and then donated them to the city. In the early 1900s he put up his own funds to hire expert planners who crafted the first comprehensive plans for Balboa Park and for general urban development in San Diego. He clearly had a lot more on his mind than just making money. One surprising aspect of his thinking turned up in a 1986 essay on Marston in The Journal of San Diego History written by Gregg R. Hennessey, entitled, “George White Marston and Conservative Reform in San Diego.” I refer to it to provide some historical perspective on the eve of a midterm election. The article then quoted from a letter Marston wrote in 1932 in response to a contribution request from a local Republican party fundraiser for the November election campaign. Norman Thomas was the presidential candidate of the Socialist Party in the 1932 election. Sources for this post included The Journal of San Diego History and historic San Diego newspapers.